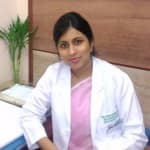 Dr. Aditi Agarwal is an experienced eye surgeon specializing in all kinds of Corneal Transplantation like PK, DALK, DSEK, Cataract Surgery (Phacoemulsification) Glaucoma and Refractive surgeries like LASIK, ICL etc. She has super-specialized in Cornea and Anterior segment from the prestigious L V Prasad Eye Institute. She holds the "Sir Ratan Tata fellowship" in Advanced Cataract Surgery from Sankara Nethralaya and has undergone training in Glaucoma at the Aravind Eye Hospital. She has also been awarded fellowship by the International Council of Ophthalmology having cleared both level I and II examinations. Dr. Aditi Agarwal earned her MBBS from the Seth G.S Medical college and KEM Hospital, Mumbai and her Master of Surgery (MS) in Ophthalmology from MGM Medical college. She was honoured with Dr J.G Thakur gold medal during her MS. She is also a Diplomate of the National Board (DNB). Dr. Agarwal has several years of rich professional experience having worked at reputed eye hospitals such as Venu Eye Institute and Research Center in Delhi, Centre for Sight group of hospitals and Artemis Health Institute in Gurgaon. During the course of her career, Dr. Agarwal has conducted numerous complex surgeries like cultivated autologous limbal stemcell transplantation, traumatic cataract surgeries, paediatric corneal transplant etc. She is a member of All India Ophthalmic Society, Cornea Society of India and Delhi Ophthalmic Society She has delivered faculty lectures and presented papers at several prestigious eye conferences including best paper award at the Delhi Ophthalmic Society conference. We are trying to make operation for eyes by using laser operation to my father can you please suggest after operation how many days he has to take rest nd how much cost for the operation nd is it good Is any other side effects Will appear to him. Rest and cost depends on what kind of laser surgery is being done to your dad who is above 45 years and what type of symptoms he is suffering from and is it something to do with retina. I have a little problem in my eyes. Any things to faraway in front of me. It should not see clearly. Plezzzz say what can I do? I am 19 years old I have problem in left eye it always red nd every time dropping tears so what I do some times I unseen some thing and at night I also crae5e that situation like I am blind person no any faced me so my request what I do. Hello, get your eyes tested from an opthalmologist. Include the following for getting better vision: vitamins a, c, e, and minerals like copper and zinc are essential to eyesight. Get the antioxidants from dark leafy greens, egg yolks, yellow peppers, pumpkin, sweet potatoes, and carrots. Include garlic and onions. Blueberries, grapes as they have antioxidant and anti-inflammatory properties that can help improve your vision. Dha is a fatty acid found in coldwater fish like salmon, sardines and mackerel. Exercises for strengthening eye muscles: -begin by partially closing your eyes; the lids should only be halfway shut. After holding for 10-15 seconds, close your eyes very slowly. Take a few deep breaths to increase oxygen in the blood. -warm your eyes. Rub your palms together to create heat, and then place them against your eyes for five seconds. Repeat this three times. -hold a pen at arm's length. Focus your gaze on the tip of the pen. Bring the pen closer to your nose at a slow and steady pace. Repeat this exercise 5-10 times. -concentrate your vision on the tip of your nose. Then shift your gaze to an object further away, either at arm's length or 20 feet away. Then shift your eyes back to the tip of your nose. Repeat this exercise 10 times. -sit in a relaxed but upright position. Begin by look to the left-most position (without moving your head) and hold to stretch your eye muscles. Hold for 5 counts. Blink and return your gaze back to look straight in front of you. Then look to the right-most position with your gaze and hold for 5 counts. Repeat 3 times, blinking between each hold. Then, repeat this exercise looking up and then down. Do not forget about blinking. -sit in a relaxed but upright position. Look up and to your right for 5 seconds. Return your gaze to center. Look up to and to your left for 5 seconds. Return your gaze to center. Look down and to your right for 5 seconds. Return your gaze to center. Look down and to your left for 5 seconds. Insufficient sleep may weaken your vision, so shoot for 8 hours of sound sleep a night. Rest your eyes 10 minutes for every 50 minutes spent reading or in front of the computer. If your eyes feel overly tired, lie down and place cooling cucumber slices over your eyelids. Medication: instill homoeopathic euphrasia eye drops twice a day. Thereafter, revert back for further guidance. Last few I am faced my eyes problem. Very difficult to see far away thing. Please help me sir. And tear come down from my face when I frocely study something. dont worry. this condition is called myopia where we cannot see far off objects clearly.Get your refraction done and wear spectacles eat green veggies. Carrots.papayas, mangoes yellow fruits nuts butter . Strain less your eyes. Relax your eyes in between work. Blink regularily if working for long time on computer. Lower the brightness of your screen. Work under adequately illuminated conditions. Also try to blink your eyes properly while work. Use good tear substitutes like genteal 4 times a day. And anti glare screen for your system. respected sir, mam. For face I am using skintight cream. But my face got little bit fair than before. But my eyes side become dark. Any cream for getting fair for whole face and neck. Dear lybrate-user:- you r suffering from wrinkles on face. Take regullar aerobic exercises, coloured fruits & vegetables, plenty of water. Avoid previous facecream. You may try patanjali anti wrinkle face cream. For our child inside the eye some small dot type white dot Is thir what can we do? Pls take him to an ophthalmologist. Its difficult to advice anything from the history you r giving. May b your child has cataract or some corneal opacity. I have serious eye problem. I have 5 dioptre in both eyes. I am wearing sunglasses from past 4 years but no improvement in eyes. For some time I used contact lens but did not suit my eyes. Tell me any way so that I can retain my eye sight. But without surgery or laser treatment. No you have to wear corrected power specs, contact lens, or you can go for lasik surgery. Ther is no other alternative. Hy, I'm Rahul and I worried about my eyes, my eyes is so weak, right - 0.25 and left - 0.75. And I wanna join in Delhi police. I don't have much more time, I think Delhi police physical test held in 3 month. So may you give me a advice. What should I do. What a home treatment and something else. Unfortunately there are no natural medications to remove spectacles permanently. Glasses, contact lenses and surgery are the only three options for good vision if you having spectacle power but considering you need to join police, you need to get some guidelines from them for your vision requirements. I have a puffy bags of under eyes from upper cheeks. It looks like extra fat nd seems like swelled up area under eyes. So tell me how to get rid this? Is there any medicine, massage oil or nothing else to. Cure this. Please tell me soon. Waiting fr your response.